PHP has some built-in functions to handle JSON. Objects and Array in PHP can be converted into JSON by using the PHP function json_encode(). The PHP json_encode() function returns the string containing a JSON equivalent of the value passed to it as we demonstrate here with the numerically indexed array. A numerically indexed PHP array is translated to the array literal in a JSON string. JSON_FORCE_OBJECT option can be used if you want that array to be output as the object instead. Let’s take an example of converting a key-value pair array to json. The json_encode() function returns a JSON encoded string on success or FALSE on failure. In the above code, we have passed an options parameter to the json_encode() function. The various options are Bitmask consisting of JSON_HEX_QUOT, JSON_HEX_TAG, JSON_HEX_AMP, JSON_HEX_APOS, JSON_NUMERIC_CHECK,JSON_PRETTY_PRINT, JSON_UNESCAPED_SLASHES, JSON_FORCE_OBJECT, JSON_PRESERVE_ZERO_FRACTION,JSON_UNESCAPED_UNICODE, JSON_PARTIAL_OUTPUT_ON_ERROR, JSON_UNESCAPED_LINE_TERMINATORS,JSON_THROW_ON_ERROR. 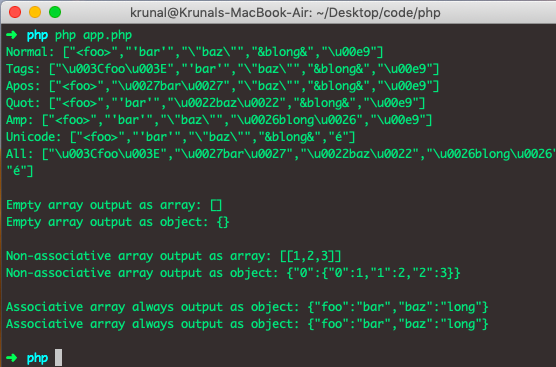 Finally, How To Convert PHP Array To JSON Tutorial With Example is over.